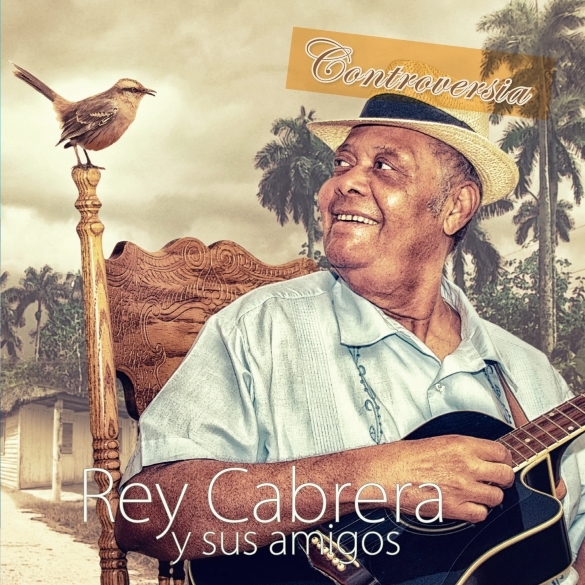 Veteran Cuban Musician Rey Cabrera Spices Up The Summer With A Brand New Album! Los Angeles, CA – Cuban born vocalist and master of the tres, a traditional Cuban style guitar, brings his finest latin jazz music to the North American audiences this coming August 5th. The extraordinary new album, Cabrera’s third full-length as Rey Cabrera y Sus Amigos, is entitled Controversia, and will be released on both CD and digitally by Goldenlane Records, a subsidiary of Cleopatra Records, Inc.
Born 1943 in the Oriente mountains that surround Santiago de Cuba, Cabrera inherited his love and passion for música campesina, Cuba’s oldest and most traditional music style, from both of his parents. His father taught him to play the tres, and before too long the young Cabrera moved to Santiago de Cuba where he met and performed with Eliades Ochoa, later of Buena Vista Social Club fame. From there, Cabrera went on to his own international acclaim as one of the last ambassadors of the Cuban musical style known as son cubano, a blend of Spanish canción and African rhythms. Cabrera has performed everywhere from the Montreux Jazz Festival, the North Sea Jazz in South Africa, the UK, and Belgium. Now this seasoned veteran will bring his immense talent to US shores – so grab a mojito and let Cabrera’s band transport you through the rich history of his musical heritage!